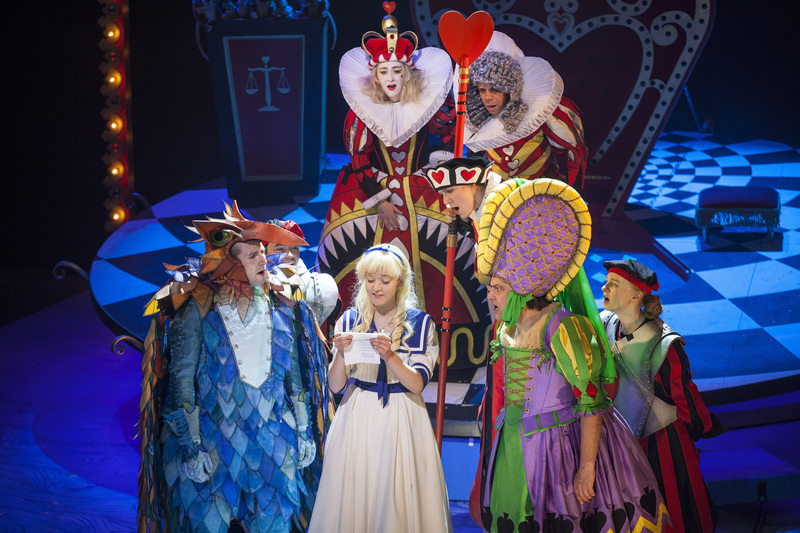 (L-R) David Carlyle as Gryphon, David James Kirkwood as cast, Jess Peet as Alice, Gabriel Quigley as Queen of Hearts, John Macaulay as King, Alan Francis as Duchess, & Tori Burgess as cast. When Alice’s Adventures in Wonderland was first published Britain also got its first speed limits for horseless vehicles. The Locomotive Act of 1865 meant no more than 4mph in the countryside and 2mph in towns, together with a red warning flag. No doubt Edinburgh Council is heading that way again, and for good reason, but that does not stop Anthony Neilson’s version of Lewis Carroll’s nonsense classic from being very welcome, fast and surprising. ‘A large rabbit-hole under the hedge’ it has to be, for how else could a very round White Rabbit (WR) go down it? Wowza! It is some exit! Children gasped. And ‘in another moment’ down went Alice after WR, feet first, ‘never once considering how in the world she was to get out again’. 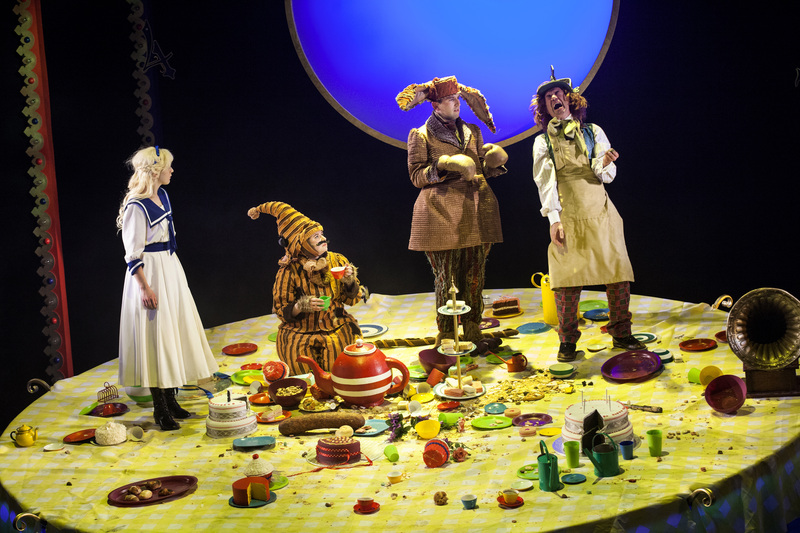 No worries – as Alice plummets towards Australia – remember that this is a ten year old on approach to Wonderland. It may, at the close, be all Victorian and ‘lingering in the golden gleam’ – and that’s ok, as Carroll admired Tennyson after all (& photographed him) – but in terms of performance and effect the surface quality is lively and attractive. There’s nothing adrift here; no pool of tears either. Instead Alice (Jess Peet) is pretty contemporary: sure-footed and unfazed, arguably more midshipman in the Home Fleet than a dreamy little girl from Oxford, but resolute with crystal diction and a level gaze. Tam Dean Burn plays the Hatter as mad as mad can be without terrifying a young audience and he has maniacal fun with the safety curtain. Mordant humour might well be the preserve of the Welsh and – for me – David Carlyle’s glum Gryphon, marvellously at odds with his colourful plumage, is the co-star of the show. He (and not the Knave) stands accused of stealing the Queen’s tarts – surely a preposterous charge, for who could refuse to follow his courtly lead in the Lobster Quadrille? As wholesome children’s picture books go The Very Hungry Caterpillar is up there with the best and Eric Carle’s creation, unlike Carroll’s, does not smoke a hookah but then it has long been observed that you ‘Do not look to ‘Alice’s Adventures’ for knowledge in disguise’. Quite what you do look for is your crazy, delighted, business and it might even, with a lot of luck, be the same as a child’s vision. A recipe for mock-turtle soup as pepper spray won’t appeal but otherwise this particular and generous invitation to Wonderland should be accepted at once, not least because no hedgehog was harmed in its production. 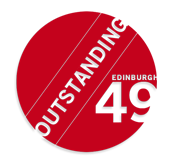 Visit Edinburgh49’s The Lyceum archive.